George Walker Bush was the 43rd President, serving from 2001-2009. His administration had its hands full. First, there were two recessions, the second being the worst since the Great Depression. Second, was the most damaging hurricane in U.S. history. Third, the administration faced the first attack on U.S. soil since Pearl Harbor. In response, it launched the War on Terror, funding two wars at the same time. As a result, President Bush added $6 trillion to the U.S. debt. For comparison, see U.S. Debt by President. The 2001 recession was relatively mild, as the unemployment rate only rose to 6 percent. President Bush launched the first tax rebate, EGTRRA, to jump-start consumer spending. Households received checks in August 2001. Before it had a chance to work, the 9/11 terrorist attacks occurred. The Bush administration responded by attacking Afghanistan, where bin Laden was hiding. In 2003, Congress passed the Bush administration's Medicare Part D prescription drug program. It covered prescribed drugs up to a certain point. Seniors paid the rest, up to another level, at which Medicare paid the rest. This unpaid portion was called the "doughnut hole." The paid portion added $550 billion to the debt. The attacks and the war hindered full recovery from the recession. Bush signed the JGTRRA business tax cuts to jumpstart hiring. Both Bush tax cuts added billions to the debt without boosting the economy by much. In 2005, Hurricane Katrina hit New Orleans, causing $200 billion in damage and slowing economic growth to 1.5 percent in the fourth quarter. To help with the clean-up, $33 billion was added to the FY 2006 budget. With little fanfare, the Bush administration passed the 2005 Bankruptcy Prevention Act, preventing people from defaulting on their debts so easily. It was great protection for businesses but had two huge negative results for consumers. First, it forced homeowners to take equity out of their homes to pay back their debts. As a result, mortgage defaults rose 14 percent, forcing 200,000 families out of their homes per year after the bill was passed. Second, people became enslaved by the cost of health care. The No.1 cause of bankruptcy is medical expenses. Without debt protection, people lost their entire retirement savings and even their home to pay their unexpected health costs. That's according to a study by the National Bureau of Economic Research. The War in Afghanistan was launched in 2001 to eliminate the threat from al-Qaida's leader, Osama bin Laden. Since the Taliban government supported al-Qaida, it was dismantled and replaced with Hamid Karzai. In November 2002, Congress passed the Homeland Security Act to coordinate terrorism intelligence. It established a Cabinet-level department that unified the 22 agencies that handled domestic security. It seemed the terrorist attack had slipped through the cracks between them. In October 2002, Bush received congressional approval to launch the Iraq War. It began on March 19, 2003, and replaced Saddam Hussein in April. By 2004, photos revealed the use of torture at the Abu Ghraib prison, worsening the situation. The war escalated. Bush sent a "surge" of 20,000 additional U.S. troops to help transition power to Iraqi leaders in 2007. War spending continued climbing during the 2008 recession, as the country focused on economic terror at home. In total, Bush spent $850 billion on the two wars, while expanding funds for the Department of Defense and Homeland Security. While all this was going on, the subprime mortgage crisis was brewing. Too many homebuyers had questionable credit. Banks pushed loans onto them that were equal to or even greater than the value of the home. Banks were making money reselling these mortgages as part of mortgage-backed securities. To feed the pipeline, they demanded more and more mortgages, eventually making loans to anyone and everyone. Things were fine until housing prices dropped in 2006. The value of the mortgage-backed securities plummeted. The hedge funds, corporations, pension funds and mutual funds that owned them were in a panic. That's because the original mortgages had been chopped up and resold, making the derivatives impossible to price. Banks stopped lending to each other so they wouldn't get stuck with the potentially worthless mortgages as collateral. As a result, interbank borrowing costs rose in 2007. The Federal Reserve tried to increase liquidity by lowering interest rates, but Libor kept rising. Monetary policy wasn't going to be enough to restore confidence. In January 2008, Congress approved the Bush tax rebates. This $168 billion package sent checks to families and Social Security recipients. Unfortunately, it also raised the loan limit for mortgage agencies Fannie Mae and Freddie Mac, worsening their balance sheets. In March 2008, these bad debts almost sunk investment bank, Bear Stearns. The Federal Reserve brokered a deal to save it from bankruptcy. During the summer, Fannie and Freddie were taken over by the federal government. It was only after Lehman Brothers collapsed in September that President Bush agreed with Treasury Secretary Hank Paulson to prevent the U.S. banking system from collapsing by getting Congress to approve a $700 billion bank bailout bill. The 2008 financial crisis caused housing prices to fall 31.8 percent, more than during the depression. Unemployment remained high, never falling below 9 percent. That did not count discouraged workers who had given up the job hunt. George W. Bush was born on July 6, 1946, in New Haven, Connecticut, the eldest of six children. He moved to Midland, Texas as a child when his father entered the oil drilling business. Bush graduated in 1968 from Yale, then enlisted in the Texas Air National Guard. He was honorably discharged from the Air Force Reserve on November 21, 1974. He then went to Harvard and received his MBA in 1975. He returned to Midland, worked in the oil business and helped out on his father's Senatorial campaigns. He married in 1977, stopped drinking, and soon became interested in politics himself. In 1994, he was elected governor of Texas, serving two terms. 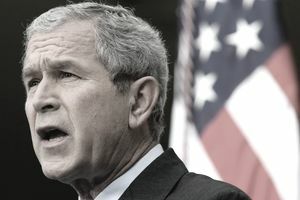 Bush campaigned for President in 2000, promising “compassionate conservatism” and a return to morality after the Clinton near-impeachment for lying about an affair. It gave him a double-digit lead over Vice President Al Gore. By the time of the election, the polls showed the two candidate neck-and-neck. Gore won the popular vote by 543,895 votes, but Bush won the electoral votes 271 to 266. His victory depended on Florida’s electoral votes, which was won, recounted and ended up being decided by the Supreme Court. 2000 $5.7 3.9% NASDAQ peaked on March 10, 2000 at 5,048.62. 2001 $5.8 5.7% Recession. EGTTRA. 9/11. 2007 $9.0 5.0% $173.6 Dow hits 14,164.43 on October 9. 2008 $10.0 7.3% $197.6 Economy shrank. Lehman collapse.